Topbiz Landing Page. 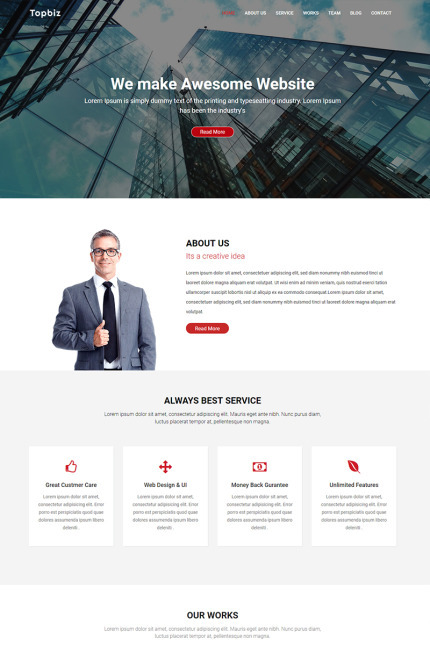 This HTML Template will suit small business, software, service, agency, landing page and creative websites. Home Page layouts and modern blog with well documentation . It is 100% responsive and looks stunning on all types of screens and devices. Well organized and very easy to customize. You can easily change the colors, icons & font style. Bootstrap 3.0 used. Html5 and css3 used with validated code.Fixed navbar when scroll. This template is Compatible with all browser.Code is clean, organized and commented to understand easily.Its so easy to customize.Google font used to optimize speed. For icon most popular icon font Fontawesome used. With this template we provide a very standard Documentaion which is easy to understand.Our support team is ready for quick support and many more.